For a more modern, cleaner, and more complete GUI-based viewer of realtime audio data (and the FFT frequency data), check out my Python Real-time Audio Frequency Monitor project. I really like the structure and documentation of sounddevice, but I decided to keep developing with PyAudio for now. Sounddevice seemed to take more system resources than PyAudio (in my limited test conditions: Windows 10 with very fast and modern hardware, Python 3), and would audibly “glitch” music as it was being played every time it attached or detached from the microphone stream. I tried streaming, but after about an hour I couldn’t get clean live access to the microphone without glitching audio playback. Furthermore, every few times I ran this script it crashed my python kernel! I very rarely see this happening. iPython complained: “It seems the kernel died unexpectedly. Use ‘Restart kernel’ to continue using this console” and I eventually moved back to PyAudio. For a less “realtime” application, sounddevice might be a great solution. Here’s the minimal case sounddevice script I tested with (that crashed sometimes). If you have a better one to do live high-speed audio capture, let me know! 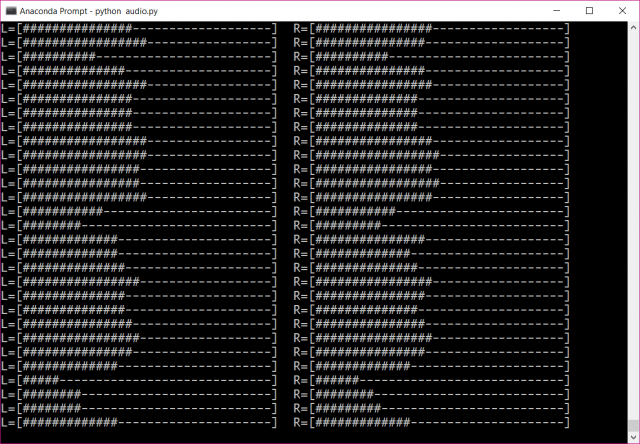 Here’s a simple demo to show how I get realtime microphone audio into numpy arrays using PyAudio. This isn’t really that special. It’s a good starting point though. Note that rather than have the user define a microphone source in the python script (I had a fancy menu system handling this for a while), I allow PyAudio to just look at the operating system’s default input device. This seems like a realistic expectation, and saves time as long as you don’t expect your user to be recording from two different devices at the same time. This script gets some audio from the microphone and shows the values in the console (ten times). I tried to push the limit a little bit and see how much useful data I could get from this console window. It turns out that it’s pretty responsive! Here’s a slight modification of the code, made to turn the console window into an impromptu VU meter. Here’s the result! I couldn’t believe my eyes. It’s not elegant, but it’s kind of functional! (and mathematically processed) microphone data. """fire up the SWHear class.""" # keep math, plotting, FFT, etc out of here. """return values for a single chunk"""
"""connect to the audio device and start a stream"""
"""close the stream but keep the PyAudio instance alive.""" # recorded and recorded over in a loop. self.tape contains this data. # but rather do math on it (like FFT) as you read from it. """add a single chunk to the tape.""" """completely fill tape with new data.""" """plot what's in the tape.""" I don’t really intend anyone to actually do this, but it’s a cool alternative to recording a small portion of audio, plotting it in a pop-up matplotlib window, and waiting for the user to close it to record a new fraction. I had a lot more text in here demonstrating real-time FFT, but I’d rather consolidate everything FFT related into a single post. 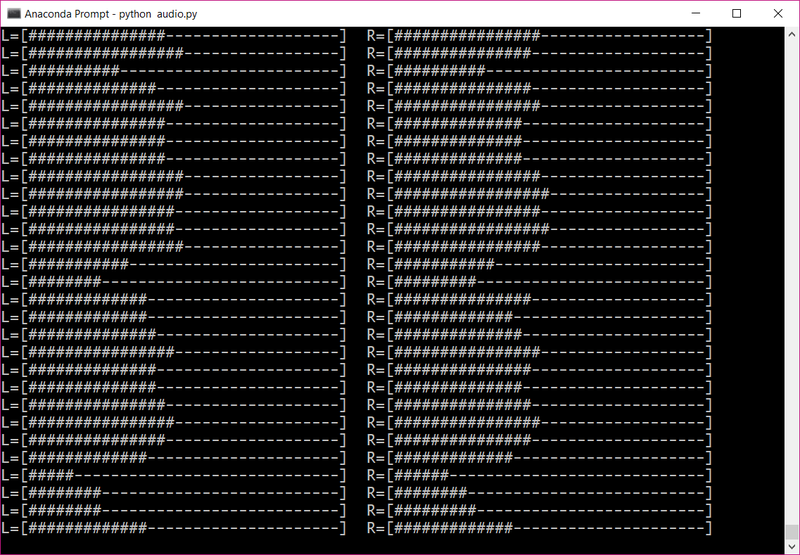 For now, I’m happy pursuing microphone-related python projects with PyAudio. assert freq[-1]>TARGET, "ERROR: increase chunk size"
If your goal is to determine which frequency is producing the loudest tone, use this function. I also added a few lines to graph the output in case you want to observe how it operates. I recommend testing this script with a tone generator, or a YouTube video containing tones of a range of frequencies like this one.